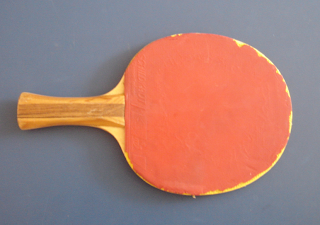 Ping Pong, Table Tennis, call it what you will, it's something that we take very seriously at Karma Crescent. Back in the day, when Dave was setting up our little enterprise, he was offered a leaving present from Channel 4 here he'd been Creative Director. Would he like a nice fat cheque, a comfy executive chair, a small island off the coast of Portugal, or shares in Microsoft? Dave, being a visionary type of chap said no to all these, and plumped instead for a table tennis table. Bored with the traditional table football or pool tables found in most agencies, Dave wanted something that would represent Karmarama's often left of centre approach, together with a sense of the exotic, with a bit of hand-to-hand combat thrown in. So, the tradition of table tennis was born. Some years later your favourite web 7.0 agency (recently voted 'most interesting place to go for a 2 week placement' by students at Nordoyggjar College of Art, Faroe) joined the Central Table Tennis League. There humiliation awaited, recounted in Dave's award-winning short book shown here. If you'd like to order one, tough as they're all sold out. But give us a lot of cash in used notes and we'll gladly break the glass.